hayderade wrote: Did you find it made drawing easier and more difficult content(on paper) easier? In standard paper based drawing i make decentish pictures but i always see people post awesome stuff like yours and think what if i had a cintiq haha. I got a cintiq because it lets you draw faster, which is good because I'm into animation. I haven't found that it has made my drawing better, but it has made drawing easier. As I said, I still look at the monitor 80% of the time, and I used a bamboo before that so the transfer from physical to digital had already been learned before I got it. Now I don't need the screen, it's just a convenience. Trying not to sound like a know it all, but I think art is more a matter of seeing if something is good or not, rather than being able to draw it good. If you draw something, but then as you're drawing you see where you're doing things poorly you can just keep doing it again until it's right. That's the best thing about digital, ctrl + z.
I think being constantly unhappy with your own ability is important for that. apackofbadgers wrote: I got a cintiq because it lets you draw faster, which is good because I'm into animation. I haven't found that it has made my drawing better, but it has made drawing easier. More a less what i figured. Cheers for that dude. You mind if i posted some stuff in this thread also once it arrives or na? Also i missed that first comment regarding Lilly. I understand what you mean. I have been drawing quite a bit of stuff of her but it always looks off. That said most are freehand copies of originals that i edit to my tastes. hayderade wrote: You mind if i posted some stuff in this thread also once it arrives or na? I think most people make their own threads, just so it's easier to organise and stuff. It's fine by me for you to post art in here though, we have our names on our posts anyway. hayderade wrote: That said your pictures of her(xmas one especially) are awesome man. Thanks C: I'm glad you like them. Eh, I'm rarely content with my ability. You just find better and better artists that you compare yourself to. I've been wishing I was as good as Weee for like 2 years. Also here's a Lilly I just finished. 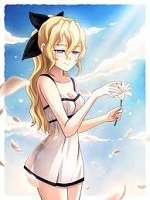 Lilly is the character that connected to me the most, given my arrhythmia and a fairly similar love encounter in the past. I know it probably just looks like another art appreciation, but you have no idea how much it means to me that someone is taking their time to create beautiful pieces of a VN character that I never knew would affect me so deeply. Nothing is forever, but what we have is life long. apackofbadgers wrote: Also here's a Lilly I just finished. Okay but more seriously, that's an adorable Lilly right there. Black suits the Satou sisters in a way that I can't possibly come up with a good simile for. MikeKS wrote: Lilly is the character that connected to me the most, given my arrhythmia and a fairly similar love encounter in the past. Sorry to hear that comrade, I hope you're alright. Lilly is totally best girl, in my humble opinion. I'm jelly that you got to be with someone like her. MikeKS wrote: you have no idea how much it means to me that someone is taking their time to create beautiful pieces of a VN character that I never knew would affect me so deeply. That's super nice to hear. 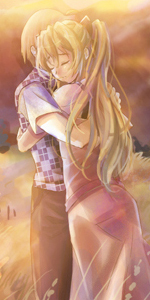 The main reason I draw katawa shoujo stuff rather than just made up characters is because I know it might end up being something others can enjoy. TubaMirum wrote: Okay but more seriously, that's an adorable Lilly right there. Black suits the Satou sisters in a way that I can't possibly come up with a good simile for. In that case, here's a sprite edit I did for the alpha repair project a year or so ago. Though I don't think it ever got used. Throwing in the Hanako edit I did too just for the sake of it. Girl I'd take that yukata out any day and month. It isn't just the black but the combination with red that was catching my eye in both of these examples. Does anybody really look bad in black though? And don't underestimate yourself there drawing characters of your own creation! You've certainly got the ability to make them shine, and you've got at least one person who would enjoy them professing such to you right now. Though I suppose here might not be the place to share? Seeing all this stuff is really hyping me for my cintiq haha. Still like 3-4 days off arriving zzzz. Then i can start making some below average content rofl. TubaMirum wrote: Girl I'd take that yukata out any day and month. I'd take it off any day of the month. Funnily enough I have. I don't really post on reddit but I did read it. Kinda guessed it might be you. hayderade wrote: Then i can start making some below average content rofl. Oh man if it's your first tablet then your stuff is gonna be so much worse than physical drawing until you get the hang of drawing and the software. Here's a couple links to my first digital drawing and my early katawa shoujo drawing (about 2~3 years old now). apackofbadgers wrote: Oh man if it's your first tablet then your stuff is gonna be so much worse than physical drawing until you get the hang of drawing and the software. I swear you are having a laugh man. You posted two really good pictures(bird looks a bit low res though). The Hanako one is pretty damn awesome might i add. If you think that is bad then my art will be truly hilarious haha. Last edited by hayderade on Sun Apr 10, 2016 5:02 am, edited 1 time in total.